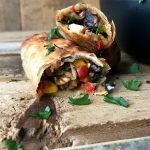 Crispy egg rolls filled chicken, black beans, corn, red peppers, garlic, cilantro, and cheese AND bursting with flavor. Not your ordinary egg roll! For the chicken: Sprinkle both sides with kosher salt & pepper. Add 1 tsp vegetable oil to a hot skillet. Gently lay chicken breast in skillet and cook over medium heat for 5-8 minutes on each side. Temp chicken to 155 degrees, remove from skillet, place on plate/cutting board and let rest for 8-10 minutes. After resting, dice into small pieces. *You can skip this step and use already cooked and diced chicken. Egg Roll Filling: In a large skillet add 1 teaspoon vegetable oil and add diced red pepper, garlic, and green onions. Cook over medium low heat until vegetables are tender. Add chicken breast, black beans, corn, diced green chiles, cilantro (if using), cumin, chili powder, and kosher salt. Stir together until combined and cook together for a couple of minutes. Stir in shredded cheese and heat until melted. To Assemble Egg Rolls: Spray a sheet pan with cooking spray. Have a small bowl of water set out to moisten finger tips. Lay one egg roll wrapper out at a time on a clean surface. Moisten the edges with your finger tip. Scoop 1/4 chicken, bean, and corn mixture into center of egg roll wrapper- Fold the bottom of the egg roll over and under the mixture, fold the ends over and moisten with water, and roll into an egg roll shape. Place on the sheet pan. Repeat until finished. Brush each egg roll with the remaining tablespoon of vegetable oil. Air Fryer Method: Preheat Air Fryer to 400 degrees. Lay egg rolls in tray. Do not over crowd the tray. Cook for 8-10 minutes or until golden brown flipping half way through. You will need to make these in multiple batches! Oven Method: Preheat oven to 425 degrees. Place egg rolls on sheet pan and bake for 15-20 minutes or until golden brown.